The Environmental Defense Center has teamed up with the City of Santa Barbara and the Corps of Engineers to create a larger-than-ever steelhead trout recovery plan for Mission Creek—a critical waterway for the trout’s migration to upstream spawning grounds. The design will be implemented in lower Mission Creek, where two old CalTrans concrete channels and two bridges that impede steelhead migration will be retrofitted into new channels that allow steelhead to once again access their historic spawning grounds. Steelhead trout are anadromous: They migrate from the ocean back to the inland streams in which they originated to spawn. Eggs are usually deposited in slow-moving streams with loose gravel, where the fry develop quickly. Eventually, some of the trout go through a process called smoltification, which enables them to withstand the harsh and varied conditions of the seawater’s chemistry. Other fry do not go through this process, and stay in freshwater their entire life as rainbow trout. (This dual option actually gives the species an advantage, allowing it to repopulate in case of drought or disaster). In Santa Barbara, much of the gateway streams connecting steelhead trout to deep perennial pools in the mountains have been channelized, obstructed, diverted or converted to agricultural land. 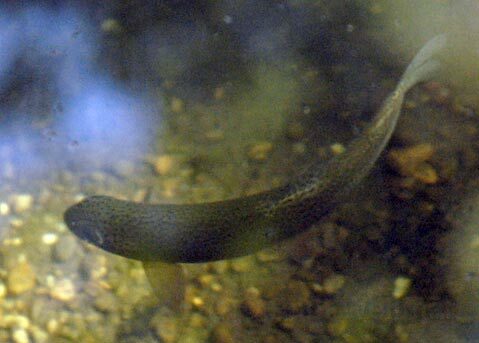 The EDC and Caltrout have worked for almost 20 years to restore the connection for steelhead on the Santa Ynez River, and the State Water Resources Control Board will decide in the next year whether additional measures are required to conserve this nearly extinct species. In Santa Barbara, steelhead migrating up Mission Creek confront a similar obstacle at Mission Tunnel, a 3.7-mile tunnel starting at Gibraltar Dam and ending in the foothills on Mission Creek. The EDC has worked extensively with the Army Corp of Engineers and the Santa Barbara Creeks Division to retrofit the design of that old mile-long stretch of concrete channel so that steelhead can swim beyond it into upper reaches of the watershed. Designed in the 1930s and the 1960s for flood control, the old CalTrans concrete channels created high velocity and low water levels, which do not fit with steelhead preferences. The new design provides various refuge zones and pools for the trout to rest in; the side resting pockets have already been tested in smaller models. This design is also intended to slow water flow enough for steelhead to migrate in, while at the same time minimizing flooding in a storm event. The EDC has already secured a portion of the funding for the project, and if the remainder of the funding is secured through state, federal, or private grants, construction could begin as early as next summer. The Environmental Defense Center also has launched a Mission Creek Outreach Program that invites the community to participate in creek cleanups and presentations on Mission Creek ecology. For more information call Trautwein at 963-1622 or email him at btraut@edcnet.org.